The Colony is an early 3d first person shooter. David Alan Smith began development in 1984 using an original 128k Macintosh. The game shipped in 1988. 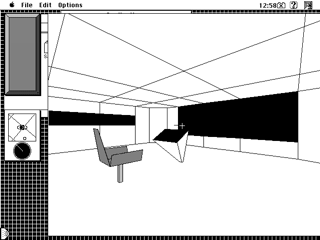 The version I played was black and white, though apparently a later update colorized it for the Macintosh II and Amiga. The Colony is a fascinating game, for the daunting effort required to get good 3D performance on such early systems. For example the game engine does not use radians or degrees to compute angles. It settles for 256 discrete pseudo-degrees, allowing sin() to be implemented as a lookup table. cos() uses the same table by adding 64 to the desired angle, shifting sin by 1/4 wavelength. 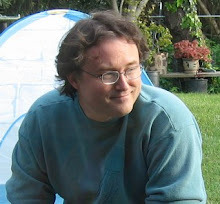 David A. Smith wrote about the development experience several years ago, and posted two videos of the game in action. The game is also notable for its almost sadistic sense of humor. 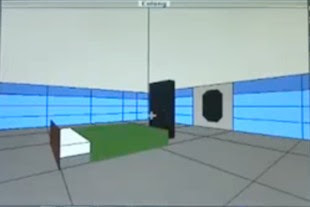 One of the puzzles is the Monolith: two connected rooms, painstakingly modeled after the small apartment at the end of 2001: A Space Odyssey. There is no exit. Once you find yourself in the room, there is no way to leave it. I saved a game in that room lo these many years ago, but unfortunately cannot load it due to a copy protection system of looking up a code in the long-lost manual. This screenshot comes from the second of the aforementioned Youtube videos instead. Poking around the game's implementation reveals another little joke from its developer. Sound effects are stored as sfil resources in a file named Zounds. One of the resources, "test," is nowhere used in the game. I first stumbled upon this sound effect in college. I wish to note that I was living in a dorm 800 miles removed from my parent's basement at the time. Note: the sound effect is copyrighted, by Mindscape and David A. Smith. It is two seconds long and clearly not material to the game, since it doesn't ever play. I believe this blog post constitutes fair use, as commentary. HTML5 is Hard, Lets Go Shopping!